The Circus Barker and Strongman, this Norman Rockwell painting, appeared on the cover of The Saturday Evening Post published on June 3, 1916. This painting was Rockwell's second picture featured on the cover of The Post. The first Rockwell Post cover, Boy With Baby Carriage, appeared on May 20, 1916. There were six Norman Rockwell Saturday Evening Post covers published that first year in 1916. The original oil on canvas painting, 21 x 20 inches or 53 x 51 cm, is currently included in the collection of ***Curtis-Publishing.shtml***. This painting also appears in six Rockwell commentary books. It appears as illustration 268 of Norman Rockwell's America by Christopher Finch, illustration 88 of Norman Rockwell: Artist and Illustrator by Thomas Buechner, on page 14 of Norman Rockwell: A Sixty Year Retrospective by Thomas Buechner and on page 75 of Norman Rockwell, A Definitive Catalogue by Laurie Norton Moffatt. This is an extremely rare find for the Rockwell collector. I have seen pristine original copies of this magazine or just the cover sell for hundreds of dollars. And yet it was just five cents when it was first published. Rockwell knew that The Saturday Evening Post was the best display window for his work. In 1916, he stopped daydreaming about having his work on the Post. At the urging of his friend cartoonist Clyde Forsythe, Norman Rockwell began working to acheive that dream. At that time, Rockwell and Forsythe shared a studio in New Rochelle, New York. Forsythe advised and critiqued Rockwell on the paintings he planned to present to the Post's editor, Mr George Horace Lorimer. In his meeting with Mr. Lorimer, Rockwell presented two finished paintings, Boy with Baby Carriage and Circus Barker and Strongman, along with rough sketched ideas for three other covers. To his great relief, The Post bought and published both paintings and gave him the green light to paint his other ideas. He was paid $75.00 each for the two completed paintings. That would equal over $1000 each in inflated 2005 dollars. Quite a sum for a virtually unknown artist. At that point in time, Rockwell had only been published in children's magazines and books. And that was the start of a beautiful and fruitful relationship for both Norman Rockwell and The Post! The Circus Barker and Strongman features six children. 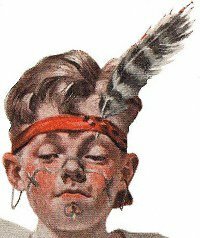 Children were Norman Rockwell's favorite painting subjects at that period of his career. Circus Barker and Strongman was only one of 322 Norman Rockwell Saturday Evening Post covers; Here is the list of Norman Rockwell Saturday Evening Post cover illustrations. Norman Rockwell presents a microcosm of the world with these six children. People love to be entertained. In the foreground are four children. Their clothing suggests that they are country kids. That they are listening intently to the other two kids suggests that they also want to be entertained. The child dressed as a circus barker is the most animated in the painting. He is wearing a top hat that is a little too big and a top coat that is way too big. Someone, most likely his partner the strongman, has painted a mustache on his face. And he is hawking his product. His product is his friend, the strongman. The rest of the sign is hidden and left to the viewer's imagination. Indeed, we have to infer from the 'S' and the 'W' that the name is Sandow. The kid pretending to be Sandow is wearing a red band around his head, with a feather tucked into it, along with gray longjohns and a nice red towel or bedspread wrapped around his waist. He has wire loops on his ears for pretend earrings. He also has painting across his face, though not a mustache. The strongman is flexing his "muscles" for the gathering crowd. Written across his chest on the longjohns is the name "SANDOW." 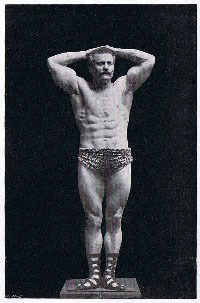 Eugen Sandow (1867-1925), a Prussian, was one of the first and most popular bodybuilders. He has been refered to as the "Father of Modern Bodybuilding". Sandow, an admirer of ancient Greek and Roman statues, patterned his physique after gladiators and mythical heroes. He actually measured the marble artworks in museums and developed his body to those exacting proportions. He was already performing strength acts in various side shows at age 19. The legendary showman, Florenz Ziegfeld, saw young Sandow's act and included him in his carnival. Sandow traveled and performed with Ziegfeld all over Europe. He came to America and performed in Chicago at the 1893 World's Columbian Exposition. Sandow was very popular in America and Europe. The photograph on the right is reprinted from Sandow's book Body Building - Man in the Making. No doubt, Norman Rockwell knew that his Saturday Evening Post audience was already very knowledgable about Sandow. Including such a reference to Sandow was akin to a television talkshow host mentioning a popular sports figure or politician in a joke. We do not know if the young Rockwell ever personally witnessed the "extraordinary" strength displays of Sandow. Knowing Rockwell's extreme attention to detail, we can surmise, however, that this representation is very likely how Sandow presented himself. Either way, Norman Rockwell was astute enough to include popular culture in his second Saturday Evening Post cover, The Circus Barker and Strongman. Do You Have A Great Story, Opinion Or Contribution About Circus Barker and Strongman?